My earliest memory of eating a PB&J is when I was about 5 years old. My family lived in New Mexico and my mom would take me to half-day Kindergarten in the morning, pick me up around noon and promptly make me a diagonal-cut PB&J once we got home. I would eat my sandwich hovering over a towel “place mat” on the floor in front of the television, eyes glued on “Woody the Woodpecker,” slurping down milk between oversized bites. Life was good back then. Mom planned everything, fed me when I was hungry, made my bed. Activities included cartoons, Nintendo and riding bikes. But life wasn’t “rich” then like it is now, filled with so many amazing people and experiences, which is why I’m OK accepting adulthood with open arms. Maybe eating a PB&J today as an “adult” is some silly attempt to hang onto the simplicity of my childhood – a time when life seemed easy and Nintendo was king. I think life can still be simple now, we just have to be intentional about it. And it doesn’t hurt to eat a PB&J (pie) once in a while just to keep things in perspective; to stay humble. Somehow the combination of peanut butter and jelly does that for me. It takes me right back to 5-year-old Dana, even if just for a lunch hour. 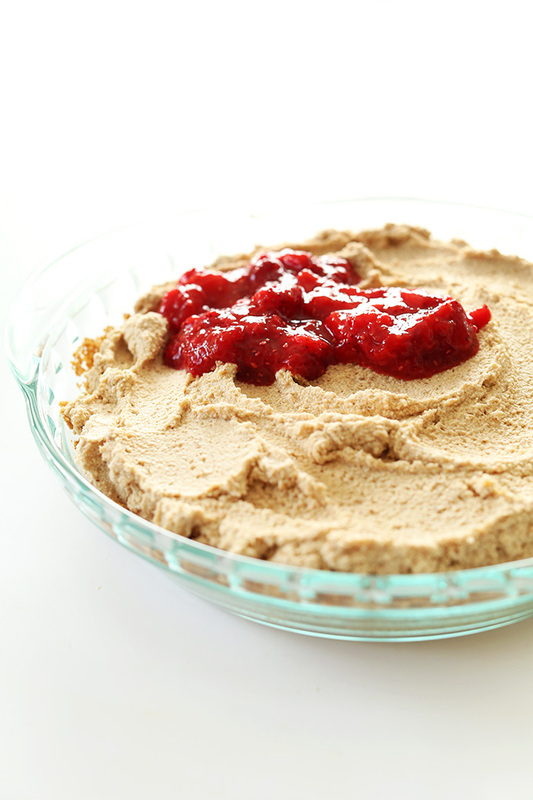 When setting out to make this recipe, I actually wanted to make a “PB&J Dip,” which you could still totally do if you wanted to go crustless. But the minute I saw the way coconut whipped cream reacted to date “caramel,” I knew a pie was in order. You guys? This filling? It’s amazing. Coconut whipped cream is already delicious on its own. But when you (naturally) sweeten it with date paste and throw in some peanut butter, things get CRAY. It becomes the thickest, fluffiest most ridiculous pie filling you ever laid eyes on. Don’t you worry. I have other ideas for this combo up my sleeve. And I LOVE that it’s entirely refined sugar-, dairy- and gluten-free! Amazing stuff going on over here. 2. Make strawberry compote and cool. 4. Add peanut butter and date paste. 6. Add pie filling to crust and top with cooled compote. 7. Chill. Eat. Start living your life. Capiche? Capiche. Let the party begin. Is there anything NOT to love about this pie? I think not. Plus, it can be even further simplified by omitting the crust and making it a dip instead. Serving bowl, fluffy peanut butter layer, strawberry jam, served with graham crackers, cookies and fruit. Hello, dip genie who suddenly has 15 friends lined up at your door for seconds. You guys MUST make this pie. You will flip over how good it is. And if you do, share it with the world by tagging #minimalistbaker on Instagram. I’d love to see you relive the PB&J of your youth in pie form. Chee-ers! 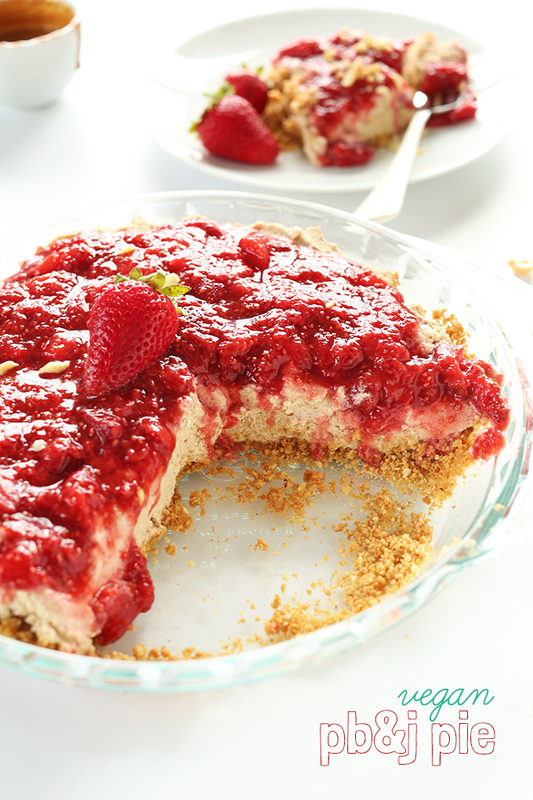 A PB&J Pie that's vegan-friendly, naturally sweetened, and requires just 9 ingredients. 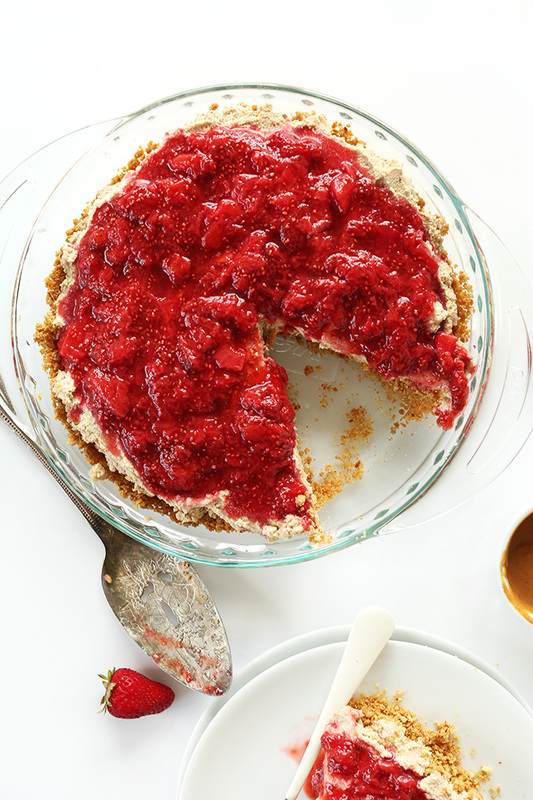 No bake besides the crust, and packs all the flavor of a classic PB&J into a healthier-for-you pie! 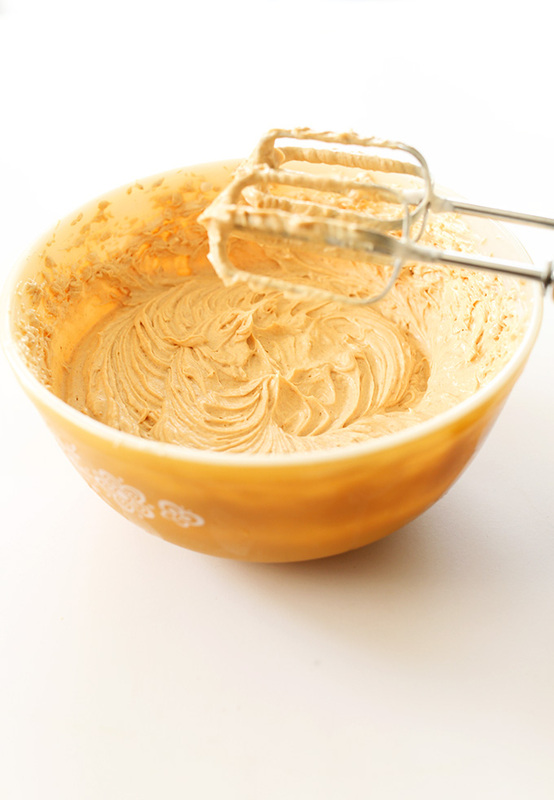 Preheat oven to 350 degrees F (176 C) and place a large mixing bowl in the freezer (for peanut butter mousse filling). Add graham crackers to food processor and process until a fine meal is achieved. Then add melted butter or oil and mix to combine. Transfer to pie dish (or an 8x8 square glass dish // adjust number or size of dish if altering batch size) and press evenly into a crust (use plastic wrap to help get it flat if you’re having trouble. Bake for 10-12 minutes or until golden brown. Then set aside to cool. 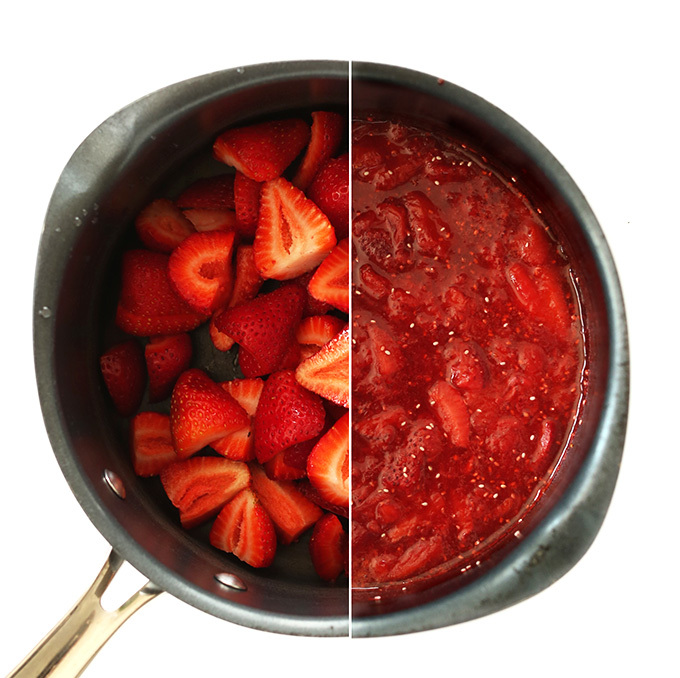 Prepare compote in a saucepan by cooking strawberries and orange juice (optional) over medium heat until very bubbly. Then reduce heat to low and continue simmering to thicken. Use a wooden spoon to smash the fruit. Turn off heat, add chia seeds (optional), and stir. Chill in the fridge. Add dates to the food processor and process until small bits remain or a ball forms. Then add a touch of coconut oil and a little warm water. Process until a thick paste forms. Add a pinch of salt for flavor balance if desired. Set aside. Being careful not to tip the cans, remove coconut milk from the fridge and carefully scoop the thickened cream into your chilled mixing bowl, leaving any runny, clear liquid in the can. Beat with a mixer until fluffy and peaks form. Then add peanut butter and date paste a little at a time until desired flavor is achieved. I went with ~1/2 cup peanut butter and nearly all of the date paste. Transfer filling to crust, spread into an even layer, and chill for at least 1 hour and up to overnight. At this point you can either slice the pie and then serve with desired amount of chilled compote, OR spread all of the compote over the pie just before serving. Pie will keep in the fridge for up to a few days. Freeze after that and serve as an “icebox” pie (thaw for 15-20 minutes before serving). *Most graham crackers are not vegan. However, Nabisco Original Graham Crackers are. You can find them at WalMart and most major grocery stores. Find more info here. *I used coconut cream from Trader Joe's, but you can also just use full-fat coconut milk. Just scrape off the top thickened layer and leave the clear liquid behind. *Peanut Butter Mousse adapted from this recipe. *Compote adapted from this recipe. *PREP TIME does not include time for chilling coconut milk. Thank you so much for sharing your recipe! How long can it sit in room temp after taking it out of the fridge? I just want to make sure the filling will still have the same consistency even after 30min. Hi Michelle! It’s best kept cold, but it will be fine left out for awhile! I made this today, and I think it’s super delicious. 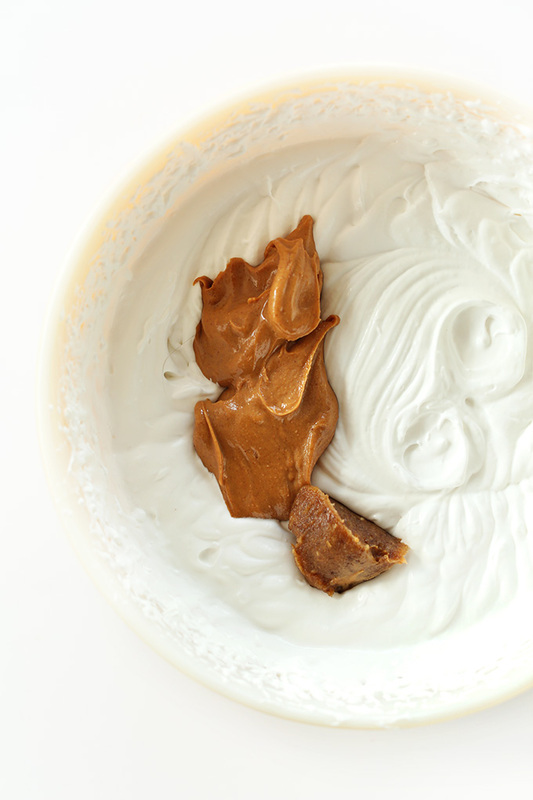 I used all 1/3 cup of unsweetened, salted creamy peanut butter and about half of the date paste to get the right amount of peanut butter flavor and sweetness for me. Thank you for sharing your recipe! I really enjoyed this pie! I just made it for thanksgiving :) I was a bit worried as the pb filling did have a strong coconut flavor, when I sampled it by itself. However, once the pie was assembled the flavors worked well together. I did add 1/4-1/2 cup of organic sugar to the pb filling as even though I added all the date paste, I did not find it sweet enough, especially for the crowd I was serving this to. I would make again! Just made this and it was delicious :) everyone in my family went back for seconds. I started offering my grandchildren & children their choice of meals for their birthdays. Four year old, Sophie said, “PB&J or Mac & Cheese. Twenty-six year old, Mindy wants Nacho Buffet… Humm! I made your PB&J Cake today! Party tomorrow! Can’t wait to try it! Seven kids and four adults… No one will know it’s vegan! Thank you for the recipe! ❤️? Hi! What size can of coconut milk does the recipe call for? They come in different sizes. Thank you. Thank you! I’m making it for our first community garden potluck of the season at the end of Feb. I’ll let you know how it came out. I absolutely love your recipes and website. My family and I have really enjoyed some delicious meals and desserts. The only tweaking I do is no oil. 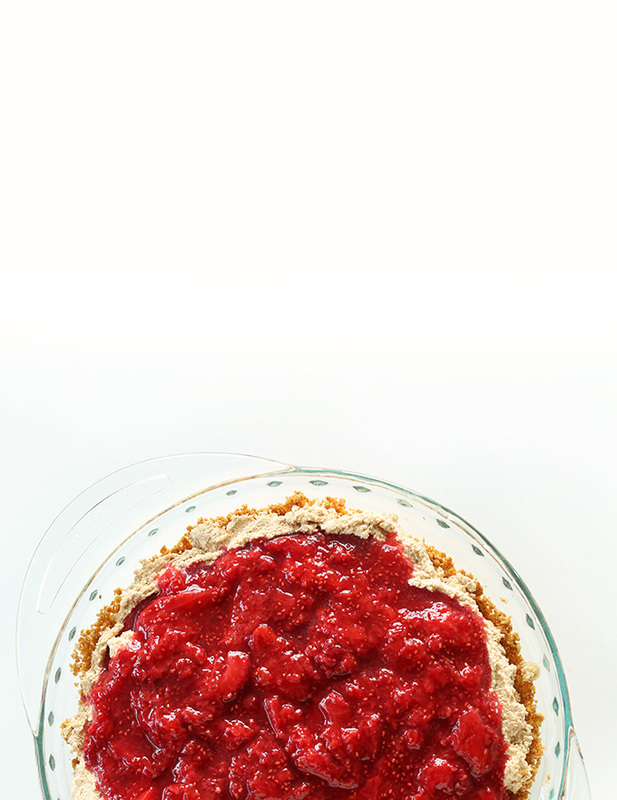 I have made the No Bake PB & J pie a couple of times now for us and our friends. All our friends were in heaven :). You make the best desserts. We actually made the vegan cheesecakes last night for our friends. They were also a hit. Thanks Dana. You’re awesome. Have you ever tried freezing the coconut whipped cream. Say I made this and froze it. Would it be ok when it defrosted? I wouldn’t recommend freezing, only chilling. Hey! Just a quick question, the recipe says 2 cans of coconut milk but I saw you used coconut cream? so it’s two cans of chilled coconut cream? You can use either! I used coconut cream, but some people can’t find it so coconut milk works, too! Thanks! I will use coconut cream since it’s so good on desserts. I thought the amount of filling would change a lot if using one or the other. Just made this for both an office event and a party at my house. So easy to make in 90 degree heat. I found it made enough filling for both pies (I just doubled the dates and peanut butter). It was a HIT on both occasions. I will definitely be making this again since I always have the ingredients on hand. Other than that it’s great! Thanks for the note! I’ll add that. 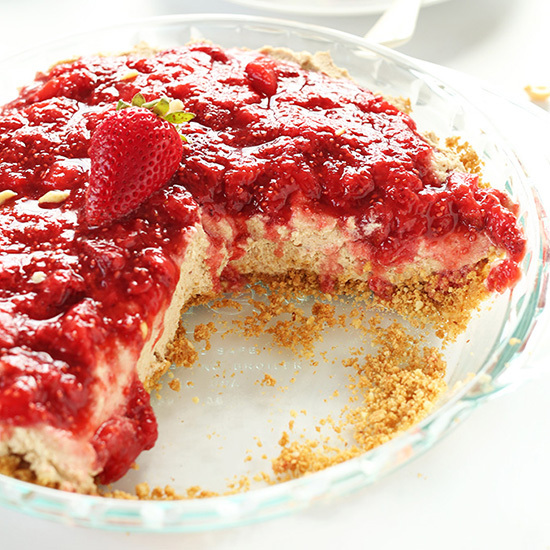 I need to make a pie for an upcoming church event, and would love something no-bake, not as traditional. Would this be okay sitting out for a bit, or will it get too soft? As long as it’s chilled beforehand, it should be fine set out for 2-3 hours. Good luck! I made this for my extended family during the holidays, and it was a huge hit! I am not a big dessert maker, so I thought I would go with a no-bake option, and this was perfect. Any recommendations for someone without a beater? On holiday at the moment and DYING to try this now that I have time to be in the kitchen but unfortunately the place we are staying in has no beater. I’m somewhat tempted to go and buy one….! I think my blender just isn´t strong enough. I´m having trouble with the crust cause the crackers won´t turn into meal. Any tips? 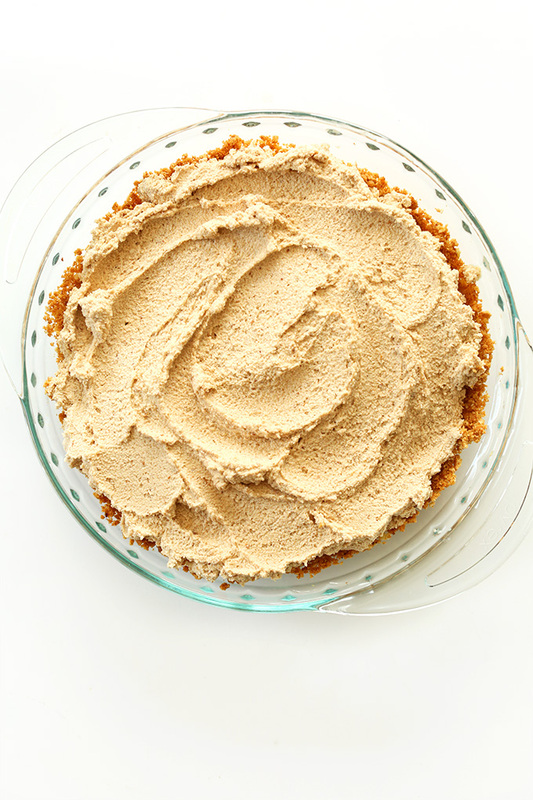 Hello, I can’t help but notice that your method for the peanut butter mousse in this recipe is different than in your recipe for Peanut Butter Cup Pie. I am planning to make the later for Thanksgiving, but would love to leave out the soy if possible. 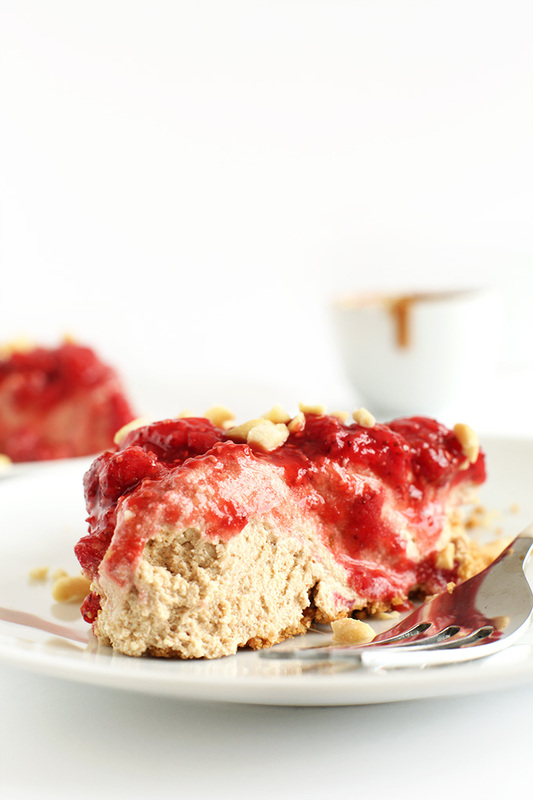 Do you think this mousse recipe will work with the Peanut Butter cup pie? Also, how do you feel about subbing peanut butter for almond butter for a Almond Butter Cup Pie? This pie is torturing me. I am embarrassed to admit that I actually dreamt about this pie last night. I’m trying to find an occasion to make it but I feel like I might just cave and make it on a Thursday night for no reason at all. Miiiaamm… I wanna do this tomorrow! Do you use 414 mL cans of coconut milk? 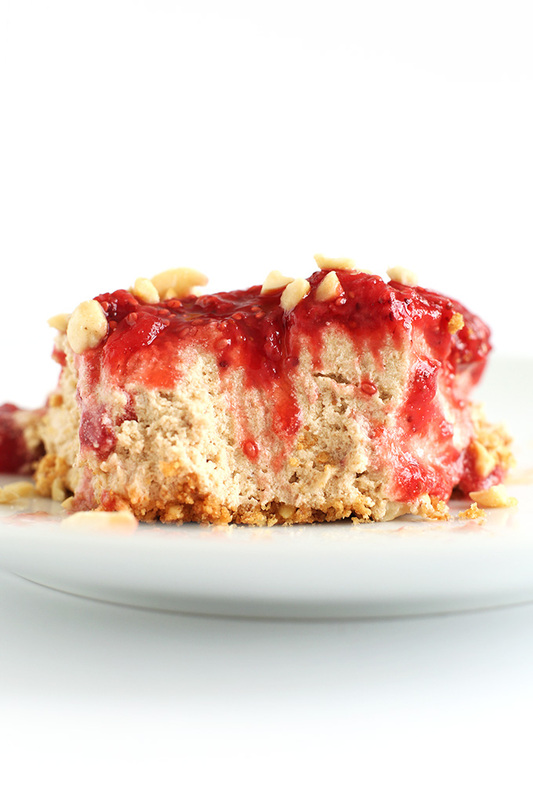 YOur pictures are incredible.. this looks indulgent, but it still comprises of healthy ingredients. Beautifully done. Would milled chia seeds still work? I made this pie last night, only I drizzled dark chocolate and peanut butter on the tip! It was no longer vegan with the chocolate, but oh so delicious! I brought it to work today and my co-workers didn’t believe me when I listed the few ingredients asking, “that’s it?! So this is kind of healthy? !” Great recipe. This just got added to our menu for the week. I mean, surely we can find SOMETHING to celebrate with pie!! My husband thinks he doesn’t like pie, so I’m determined to change his mind :) Thaaaanks, this looks incredible!! Hi Dana! I made this last night and can’t wait to get stuck in!! I was wondering—for nutritional information, what portion of the pie is one slice? 1/12th? 1/16th? Thanks for always posting such awesome stuff and beautiful photography!! just found you guys! so happy! people totally after my heart! 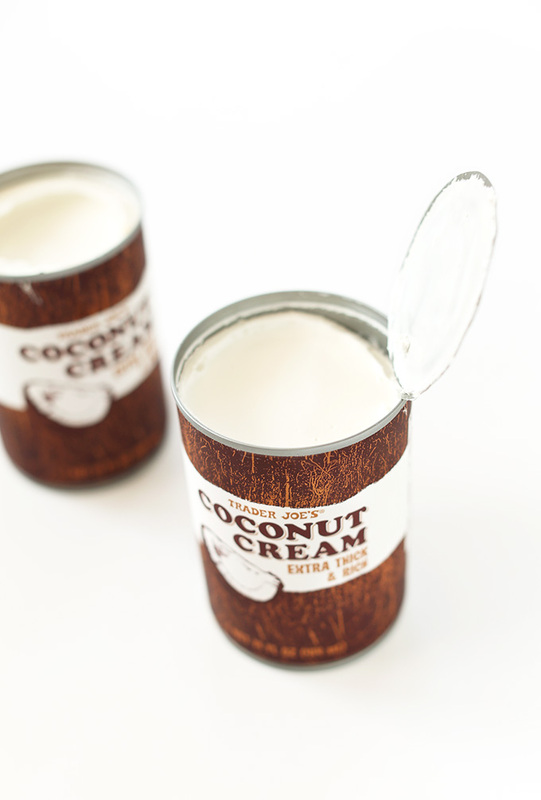 one Q about the coconut cream, is that one can cream / 2 cans reg with the fat part removed? i’m dying to try this! Hey Angela! It’s two cans either way. If you use coconut cream, it will yield slightly more than if you use coconut milk. So just adjust your pb/dates accordingly! This looks so incredibly delicious!! I have a big jar of coconut cream–how much should I use? Thanks!! I’d say about 1.5 to 2 cups! Are you kidding me with this??? How did you not eat the entire pie in one sitting? I feel like it would come to that if I made this. 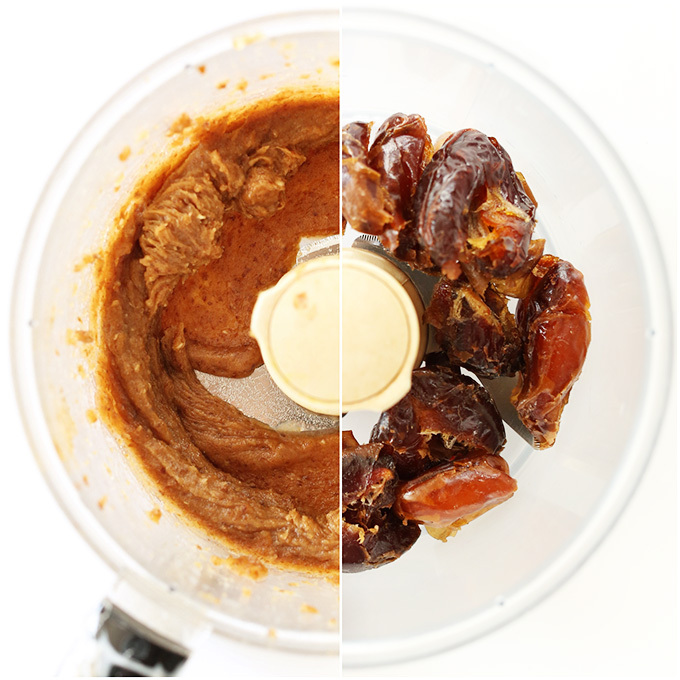 I can’t even imagine how incredible dates + coconut cream is! Looks delicious! before and after pictures were very nice. success. This recipe is circulating as gluten free. Is there a GF alternative you’re able to recommend for the crust? Any GF cookie should be able to work in its place! Oh my gawd! So good! It is just as beautiful as it is tasty! Thanks!!! We spent some time in Bali & 11nts. on a liveaboard scuba diving and visiting remote villages from Maumere – Alor! Amazing trip! Challenging/advanced diving, but very fun! I grew up eating only pb&j sandwiches for lunch because I really disliked lunch meat. Isaac also loves the peanut butter and jelly combo so I know he would eat this pie up. I’ve already pinned it and I’m planning to make it sometime for a special treat. Love that it has no refined sugar. Why do you use coconut oil in all your recipes? It’s loaded with saturated fats. Are you trying to give your readers a heart attack? Hello, dream recipe! This is the perfect dish to bring to my book club, where everyone is either gluten-free, vegan, or not eating sugar. This looks divine! I live in the UK where it’s really hard to find graham crackers. So I want to substitute something similar by weight. Can you tell me roughly how much a sleeve of graham crackers weighs? I want to bring this to a party – thanks! ps – just made your key lime pies. Wow! and I’m not even vegan. Um, roughly 3.5 ounces I think! One box is 14.4 ounces, divided by four is about that. Hope that helps! Brilliant, thanks so much! I’m going to make it for a party in Hyde Park this weekend so will let you know how it goes down. This looks amazing-a creative take on comfort food! I grew up in New Mexico! What area did you live in?? I could eat PB&J for the rest of my life–I’d choose it over anything, even chocolate and caramel. I’m totally bookmarking this for next week’s vegan potluck. Thanks a bundle, Dana! This looks insane! I want to swim in that filling! I especially love the pb mousse, which I bet would be so tasty in bitesize balls encased in a chocolate shell! Girl, you just made my day! Thanks for sharing! So glad you found us and you’ve found some inspiration here. Cheers! This looks uniquely good!! When I get over jet lag and crawl out of my cave, I am going to make this!! haha, recovery pie. Hope your trip was fun! Where did you go? This sounds so amazing! I don’t know why, but anything that is PB & J flavored instantly grabs my attention. Maybe because I associate it with comfort food? Totally! It’s comfort food all the way, only this is a little on the healthier side! PB & J will be with me till the day I die…this looks A-Mazing!!! The list of yummilicius treats I want to try just gets longer, most of them consisting of “Dana’s this” or “Dana’s that”. :P This one is definitely being added!! Thanks for all the awesome recipes!! haha, made my day! 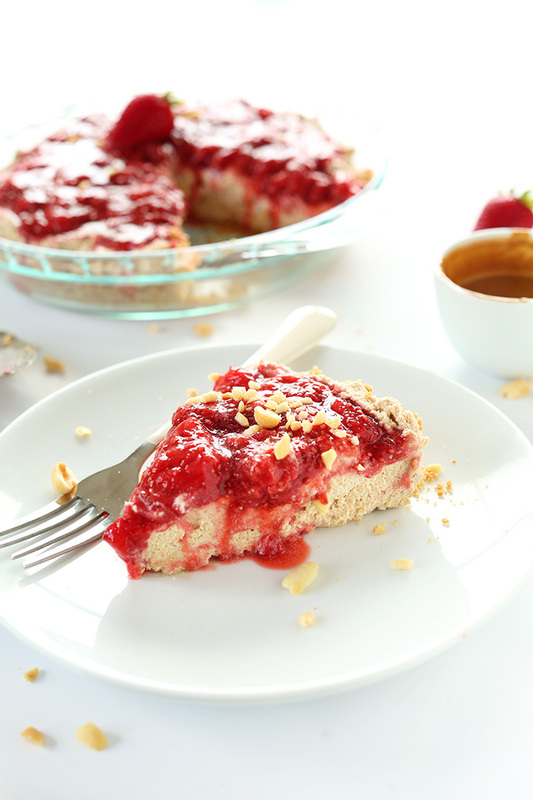 Hope you get around to making “Dana’s PB&J Pie.” It’s a winner. Intentional Living in my adulthood sounds great to me but what sounds better is your PIE! I played Nintendo too, Mario, donkey kong, a “shooting” ducks game and the Power pad, I was pretty cool, huh? Well I played by myself a lot.. Have a great day! So cool. Did you have the foot pad for nintendo so you could do track meets? THE BEST. I MUST make this NOW. This is gorgeous and looks like a DREAM to eat and doesn’t seem that labor intensive at all!!! It’s beautiful! It’s perfect!! Thank you!! I just got a little light headed thinking of how amazing this is going to be in my mouth… once again you have developed genius. Oh yes please! So easy to make and I know a couple of kids who would love this! i love this post so very much. your words about intentionally leading a simple life… i think that might be my new mantra. 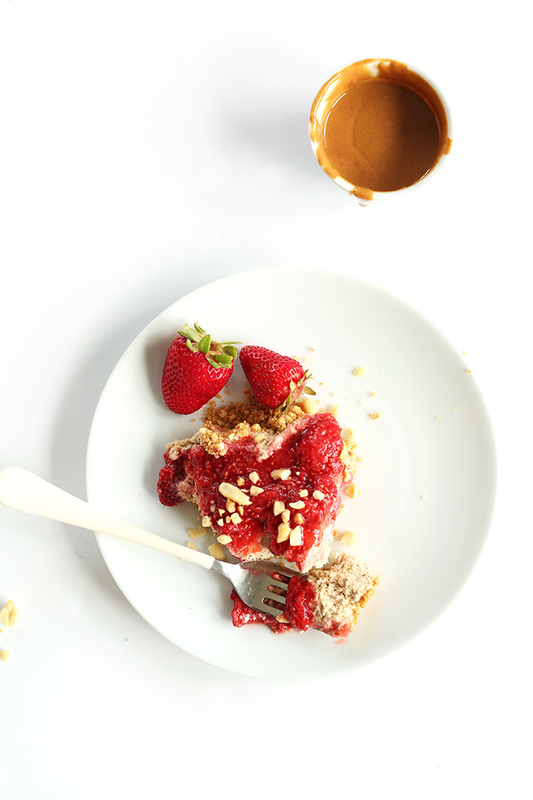 i’ll definitely be bookmarking this pie for my man’s birthday… he’s obsessed with peanut butter pie, but not down with a ton of refined sugar! This is the pie of my childhood dreams! Holy delicious! This is definitely calling my name! I just need to get the coconut cream! DO IT. Hope you love it, Danielle!